Asus' Zenbook 3 Deluxe won't get as much love as the company's Zenfone AR smartphone with Google Tango, but it's a stunningly thin laptop with some great features. The 14-inch laptop, introduced at CES, fits into a 13.3-inch frame thanks to a smaller bezel surrounding the screen. Cutting the borders around the screen is a growing trend in laptops. The Zenbook 3 Deluxe is priced at US $1,699 and will ship in May. It is not to be confused with Zenfone 3 Deluxe, an Asus smartphone. The laptop is just 12.9 millimeters thick, and light at 1.09 kilograms. It is loaded with some of the latest technologies, thus the expensive starting price. It has Intel's latest Core i7-7500U chip, based on Kaby Lake architecture, and also the chipmaker's integrated graphics. Asus says you can attach two 4K monitors to the laptop. 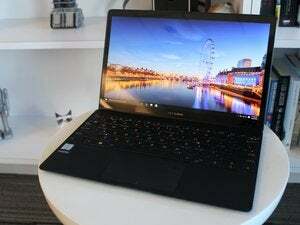 The laptop can also be configured with 16GB of RAM and 1TB of NVMe SSD storage. It has two Thunderbolt 3 via USB Type-C ports, and one USB-C 3.1 port. It also offers 802.11ac Wi-Fi and a 720p webcam. The full HD display is coated with Corning Gorilla Glass 5, which won't crack easily if the laptop falls. The laptop is comparable to Lenovo's popular ThinkPad X1 Carbon, which was also upgraded with Intel's Kaby Lake chips at CES. The Asus laptop is thinner and lighter, but the X1 Carbon can be configured with a higher resolution 2560 x 1440-pixel screen. Asus also boasts of some video and audio improvements in the laptop. It has Asus' SonicMaster Premium quad-speaker audio system and uses some tweaks to improve the quality of the screen.